My Cayman is in for a service and a few items to be sorted under warranty, so I have a loan car for a week. As it happens, it is almost exactly the updated version of my own car, a modestly specced Cayman 2.7 in Guards Red. It is sitting outside the house as I type, see the enclosed picture. It has leather seats, 20" wheels and a PDK gearbox, and a few other unimportant trinkets. I confess that my initial reaction to it has been rather lukewarm at best. Sure it is fast, comfortable, rides well, but initially at least it seems to be lacking a certain "Porscheness", it would not be hard to believe I was driving a Mercedes or a BMW. It feels to have put on a lot of flesh over mine, such that I can’t feel the bones the way I do in mine. This makes it a better everyday prospect, but I’m not sure how "special" it feels. In particular the PDK gearbox is undeniably clever, but still feels totally out of place in this car. Of course the throttle pedal is now effectively choosing the gear ratios as well (in auto) and requires a level of ham-fistedness that offends my feet, which have spent years learning how to be subtle with a pedal, and don’t take kindly to this clumsiness. I also confess that after a mere 24 hours and only a few miles I am getting accustomed to it, so I shall deliver my final verdict next week. Watch this space. 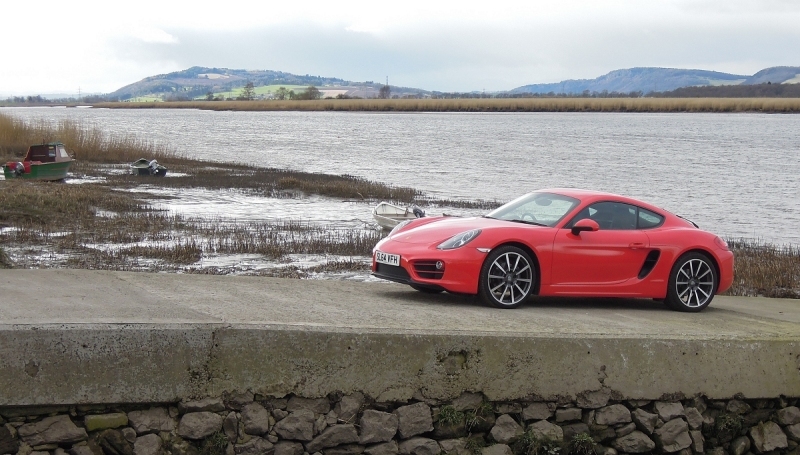 Yesterday we drove up to Dundee in the new Cayman for an overnight stay and dinner with the PCGB, very good it was too, and this morning we drove home. Both journeys were on the A92 through rural north Fife, for decades one of my favourite roads for a wee blast, but now sadly blighted by traffic and speed cameras, meaning that a 60 mph convoy is the best you can hope for. This can still be enjoyable, as a recent journey in my 924 showed, enjoying the interaction between car and driver at modest speed. It pains me to report that our journey to Dundee and back in the new Cayman was one of the most disappointing of recent memory. At 60 mph the new Cayman is doing 1,800 rpm, and in auto, if you lift off at all it goes into "sailing" mode where the engine mechanically disconnects and drops to 600 rpm and you freewheel. This behaviour is perhaps fine and dandy for a big luxurious Mercedes or some such, but feels laughably wrong in of all things a Cayman, which is supposed to be a bright and vibrant car at any speed. The new car feels like a total somnambulist. Granted you can poke it awake with a clumsy prod of the right foot, but then it hunts around the gearbox for a second or two, before the big shouty exhaust kicks in and it lunges forward. On paper, the times may be competitive, but the whole thing is deeply unsatisfying to the seat of the pants and the fingertips. I have no doubt that if the road was clear, and I had selected sport mode, or changed manually, I could have roused the beast within and devoured the road well into 3 figure speeds with massive grip, stunning braking, and lightning gear changes, but this is a fantasy these days. What they have done with the Cayman is to "improve" the performance envelope, by moving it up the range to a point where you cannot safely use it on the road any longer. The corollary of this being that the useable bit lower down, where thankfully my old car still feels alive if stifled, has now moved into total sleepwalking zone. Moral of the story ... more is not better! I thought it only fair that I take it out and try and find some roads where I could extend it a bit, but would you believe I almost had to force myself. A brand new Porsche at my disposal, yet I am so luke warm about it the best I could manage was a run to Perth, and even then I barely scored more than a few miles at anything more than cruising pace. To be fair, used in manual the thing does come alive, upshifts are instant, and downshifts are accompanied by a little throttle blip. Annoyingly, they have calibrated this to be just a tad too aggressive, so it tends to add a tiny shunt of extra speed when you are shifting down. Most folk wouldn’t care (or even notice) but it was yet another little thing about this PDK set-up which upset my natural driving flow, deeply annoying. The massive 20" wheels and huge tyres dominate the feel of the car, giving huge mechanical grip, yet somehow smothering the steering feel. Point it and it goes obediently, but tells you nothing. My car squirms about quite a lot, which tells me loads about the road surface and how grippy it is. This set-up feeds back nothing that I could detect, which means that most folk will just assume grip is there forever, and probably get a very nasty surprise when the limits of traction are finally reached. The interior is comfortable but the amount of shiny metal jewellery annoys me, and the electronic interface is just too complex, multi layered and not really that intuitive. Audi do it much better. So to sum up ... it’s pretty, fast, gaudy, complex, grippy, and easy to drive fast with limited skill but it cares not a fig for the finely honed driving skills I have developed over the years. I still don’t really like it. Been using the car for general stuff; commuting to work, going to the shops, getting stuck in traffic, etc, and there is no doubt it is a lot easier to live with than my old car. Also been experimenting with the gearbox. Cannot get used to the buttons on the steering wheel at all, but am making progress using the old "tiptronic" style gear lever, and by selecting manually there is no doubt it responds better. On a short cross country blast it was undeniably effortless, pretty rapid too, but it doesn’t feed back to me the way I am used to. It still feels a bit too much like driving a simulator, or a computer game. It also seems to attract more attention than my car, but not necessarily from other car buffs. Those groovy looks and blingy wheels clearly have some showroom appeal, and if you add in the general easier to live with factor, it is probably no surprise why the new Cayman seems to be selling better than the old one, and to perhaps a slightly different audience too. Maybe this is progress. Maybe it’s me that’s wrong. I hand back the new car, pay the service bill, and collect old faithful. Oh no … it’s not me that’s wrong after all, cos I’m barely out of the car park when all my driving senses come back to life. 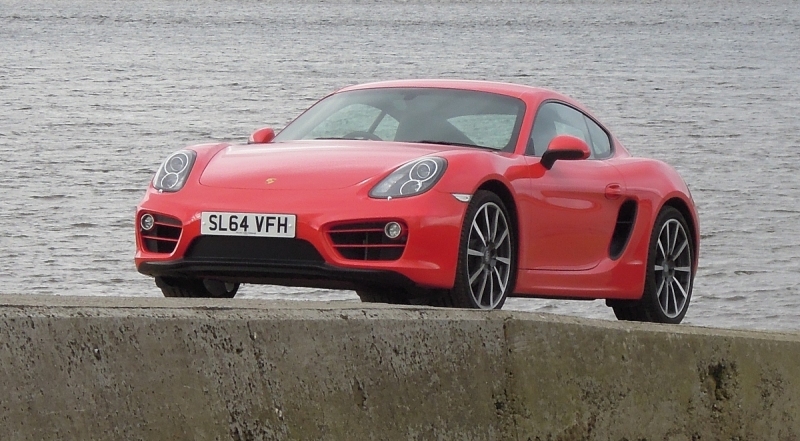 Even at modest speeds my old Cayman positively crackles with life and vigour in a way the new one simply doesn’t understand. Freshly serviced the car is running like a peach and the journey home is a delight, even though we never trouble the speed limits. The steering is light and alive, the throttle pedal is like a hair trigger, there is no dumb auto-box to add its opinion to my inputs, and the car feels amazing. A proper sports car. A proper Porsche! So where does this leave the new one? The auto box, the huge tyres, the lifeless steering, the ultra long final drive ratio, all conspire to make it relaxed and easy going, a perfect car to use every day, but which wont thrill you much at legal speeds. Grab it by the scruff of the neck and thrash it, and for sure it will out perform my old one, but at speeds that will cost you your licence if there is a man in a van with a camera watching you. And there are a lot of them around here! I’m sure Porsche has researched the market well, and knows that this is the sort of car that will sell in big numbers, but I won’t be one of them. 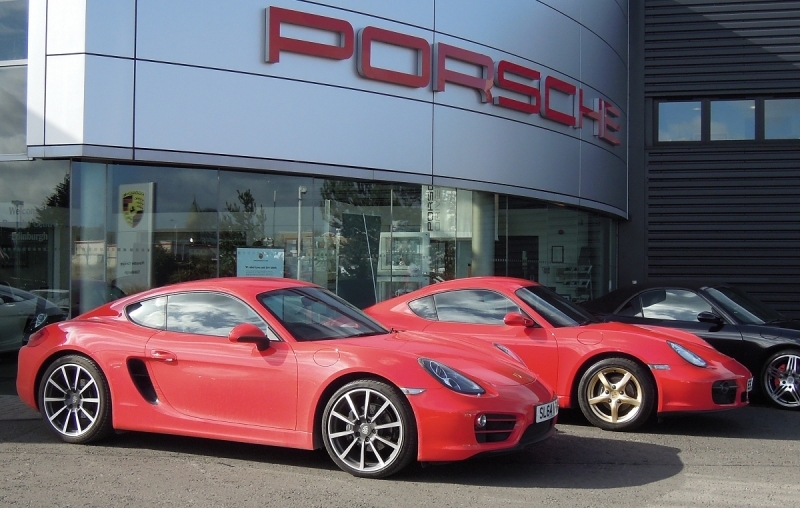 I equally hope their research tells them there is now room below the current Boxster/Cayman in the range for a smaller, lighter, cheaper, less powerful sports car, but one steeped in the old analogue Porsche values of old. 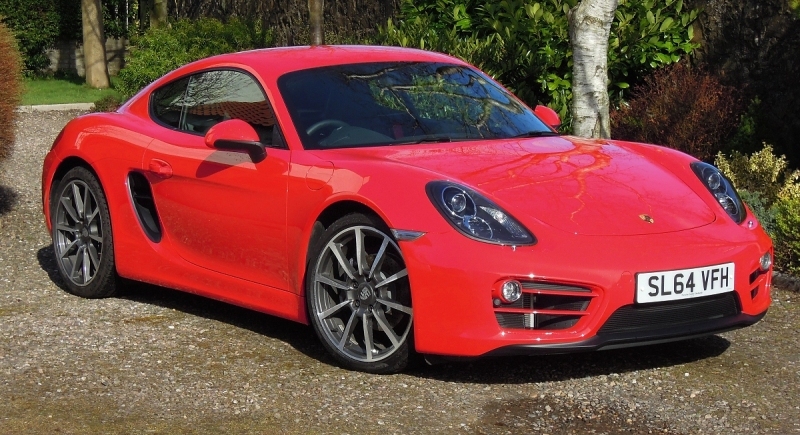 I’d buy that, but until then I’ll revel in my own Cayman, a future classic for sure!